President of Kazakhstan Kassym-Jomart Tokayev has arrived for a state visit to the Republic of Uzbekistan, Trendreports citing Kazinform. On Sunday evening, the plane of the President of Kazakhstan landed at the Tashkent International Airport named after Islam Karimov. There, the Head of State was greeted by Minister of Foreign Affairs of Uzbekistan Abdulaziz Kamilov and mayor of Tashkent city Jahongir Ortikhodjaev. According to the Akorda's press service, during the visit the leaders of the two countries will discuss the topical issues of bilateral cooperation aimed at further strengthening of trade and economic, social and humanitarian, transit and transport cooperation as well as the key problems of regional and international agenda. The visit will result in signing of a number of important documents. 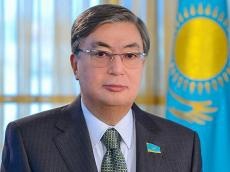 Also, Kassym-Jomart Tokayev and Shavkat Mirziyoyev are expected to participate in the solemn ceremony of inauguration of the Year of Kazakhstan in Uzbekistan.